Have you ever wanted to go for a run, but discovered it was raining or 100 degrees Fahrenheit or even just muggier than Louisiana outside? If so, it’s possible to take advantage of an elliptical, the indoor running sensation sweeping the nation since the 1990s. Today we break down the differences between two very popular units - Nautilus E614 vs Schwinn 430. Before we do though, a quick history lesson on ellipticals and the benefits of owning or using one for a runner. Before we break down the differences, let's first look at what an elliptical is. 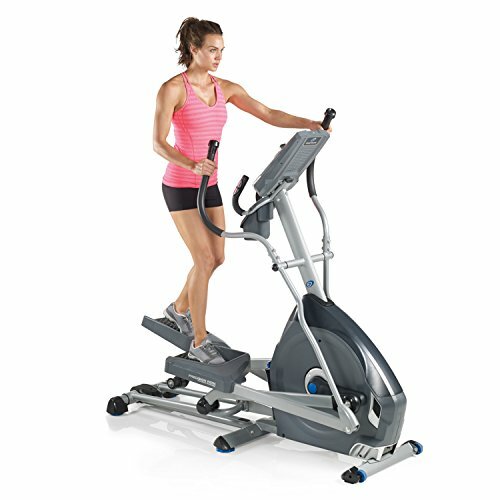 An elliptical is a special type of running machine which includes two separate pedals connected to long handles that the runner can grip. The user moves up and down like they’re running, moving the pedals in ellipticals. This motion simulates running without any of the tension or joint pain caused by regular running or jogging outside or on a treadmill. 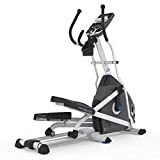 Ellipticals are a relatively new machine, having debuted in the 1990s. They tend to be more advanced than treadmills and have more moving parts, but also rely less on technology to operate. The below video shows what an elliptical looks like in action and how a person should move on one. There are a lot of benefits of an elliptical, both because of the machine itself and the pros of regular running. Many people enjoy this machine because it lowers the stress on joints like the ankles and knees. Running is a very intense activity which puts a lot of force on the feet and joints. Research by the scholars Tongen and Wunderlich demonstrates that a lot of the running force is concentrated on the knees and that the shorter the stride, the greater this strain. 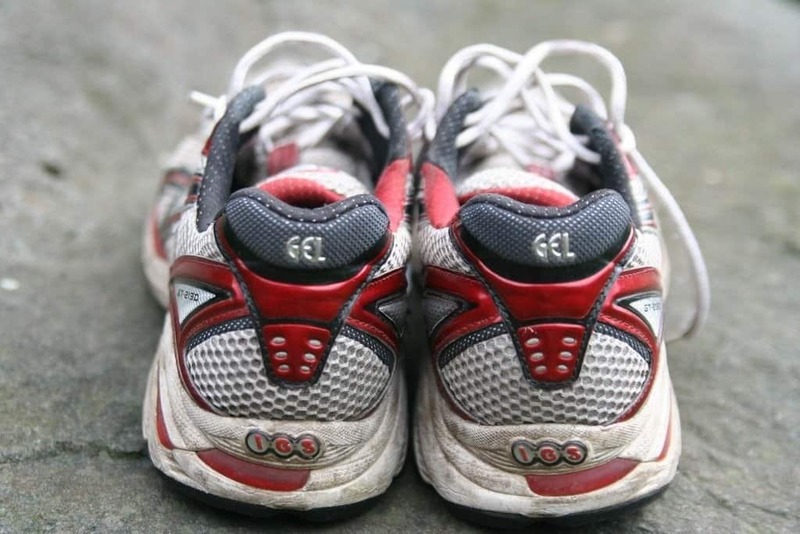 This pressure is especially great for users of treadmills or who run on sidewalks. Ellipticals avert a large portion of the problem since the user’s feet never leave the ground. The elliptical also works out the muscles in the arms as well as the legs. The handles that the user holds on to move back and forth with the person’s feet. This movement involves a fair amount of pushing and pulling, working out the arms in addition to the legs. So What are the Benefits of Running? This research is so common and well done that it can be found from numerous sources around the world, including in publications from places as illustrious as Harvard University. According to documents released by the college, running improves heart health, general vitality, the function of the respiratory and circulatory systems, and can even elongate a person’s life span. Even the Australian government, like many others around the world, recognize running’s effects. Even simple jogging is enough to improve bone strength because of the weight upon them as well as the force of muscles pulling on bones, forcing them to shift and develop further. We break down in further detail the benefits of running (especially a 5K) here. These two ellipticals are very popular and are often found at many gyms/health clubs across the country. Schwinn and Nautilus are the best, affordable ellipticals on the market. We detail the differences below. 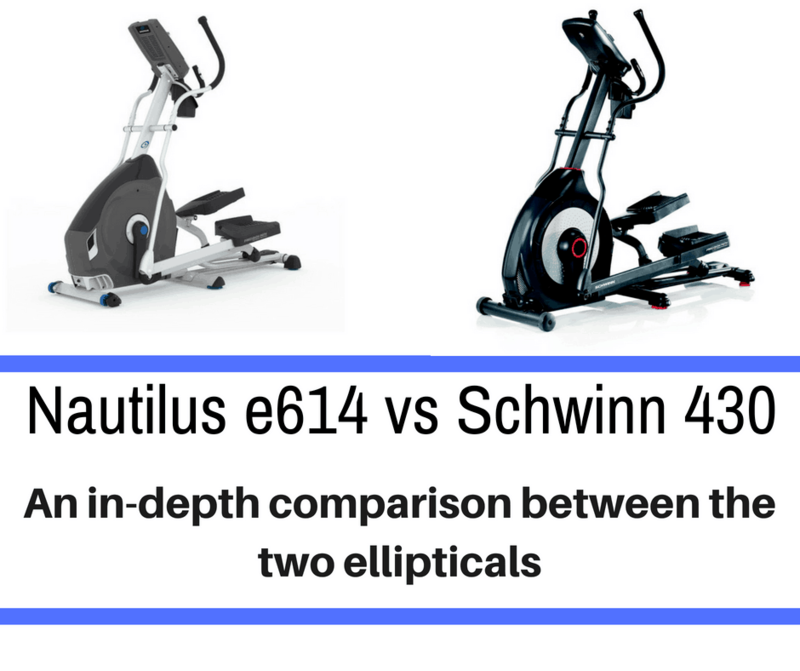 The Nautilus e614 is considered an older model of elliptical since it came out a few years ago. This machine can be built by a single individual. It has dimensions of 50 x 34 x 22 in. It measures the runner’s heartrate through contact pads in the handles. Like many ellipticals, the Nautilus e614 has a display screen which shows important information such as the distance and speed ran, how fast the user is going, calories burned, and the runner’s heart rate. It does require batteries. The full machine additionally has several built-in fitness programs, a manual incline, and 20 separate resistance levels to build muscle. The footplates on the machine are large and comfortable with extra cushioning. There is a charging station for a phone or tablet but no Wi-Fi or Bluetooth connection, which some might find irritating (myself included). The machine can hold a maximum weight of 300 lbs. and comes with multiple warranties: 10 years for the frame, 2 years for mechanical pieces, and 1 year for electrical parts. There is also a 90 day warranty on the labor required to put the machine together. Overall it is a quality machine that can help you reach your fitness goals. It does have some bells and whistles but if you are looking for connectivity with your smartphone, this is not your machine. The Schwinn 430 elliptical is one of the better looking machines on the market, coming in a snazzy black and red design which is sure to catch attention. The machine has dual track LCD screens that show a lot of relevant information, including the speed a person is running, total distance covered, calories burned, and the user’s heart rate. The heart rate sensors for the machine are in the handles. The elliptical has 22 different fitness programs preloaded into the system, 2 different user settings, and personalized goal tracking for the runner. There are a total of 20 levels of resistance and a discreet flywheel which keeps the machine quiet and smooth. There is a charging USB port as well as a port for data exchange. 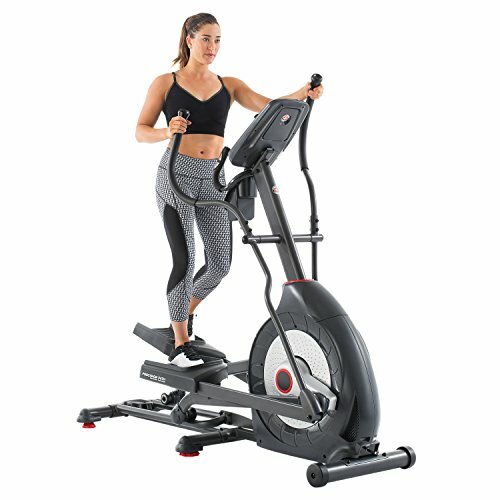 The elliptical’s full dimensions are 70 x 28 x 71 in. and it weighs a grand total of 182 lbs. People who weigh up to 350 lbs. can use the machine. It has a cooling fan and water bottle holder, and overall seems like a great machine. So, how do these treadmills stack up? Both are similar to one another, but the main differences are durability and technological advancement. The Schwinn 430 definitely has more bells and whistles than the Nautilus e614 and has a classy appearance, but this doesn’t mean it’s better. In terms of sheer durability, the Nautilus e614 blows its competition out of the water. While the Schwinn 430 is nice and reliable, many of the parts are made from cheaper materials which are unlikely to last as long as the more quality pieces in the Nautilus e614. But, like was said, this Nautilus is not as advanced, which many people dislike. So depending on what is important to you, one might be a better choice based on your situation. So, where does this comparison leave people interested in these machines? The main conclusion comes down to functionality over looks, and the Nautilus e614 has durability in spades. But, a runner’s experiences might differ, so it’s important to test any machine model before purchase to ensure the highest comfort and quality. Proform vs NordicTrack - What's the Difference?